For a long time, I watched jealously as my friends racked up miles on their credit cards and traveled the world. I wasn’t a big spender, so it seemed it would be years before I’d be able to score even the cheapest clearance-sale flight — like a weekend in Detroit, in February. Then, I got serious about becoming a travel-hacking “miles ninja” and, with a few simple tricks, I’m now flying high. In fact, in just the first six weeks of 2015, I added nearly 25,000 miles to my USAir Dividend Miles account — without any binge shopping . That’s enough for a domestic round trip anywhere in the U.S.! Want to give travel hacking a try for yourself? Here’s how I did it. I’d been using two credit cards to earn miles: Capital One’s Venture card and a USAirways MasterCard. Venture famously gives you two miles for every dollar you spend. Looks like a great deal, right? I thought so, too, so I used the USAir card only to buy USAir flights and products, which earned me double miles and Zone 2 boarding. I thought this was a clever, well-reasoned strategy. But then I realized my error. Venture charges a lot more miles than USAir to book a flight. After using the Venture card as my main credit card for four years, including using it to buy all the building materials to renovate a big house and earning a 50,000-mile sign-up bonus, I had 129,000 miles — enough to buy one round-trip ticket to Scotland. That looks OK, except trips to Europe on USAir start at 60,000 miles — so earning “double miles” on Venture is essentially the same as earning single miles on my airline card. Once I realized this, I started noticing incredible offers and bonuses from airline credit cards — opportunities to rack up miles a lot faster. Once I chose the card with the best value for me, I started using it for all my spending, quickly earning more miles. Many airlines offer online shopping portals; when you click through to retailers from your favorite airline’s portal, you can earn points on your purchases. Even better, the retailers regularly make insane offers of bonus points for your purchases. For example, from December 15, 2014, to January 15, 2015, PetSmart offered USAir cardholders 15 miles per $1 spent, with no limit on miles you could earn. During that time, I practically melted my card swiping it at Petsmart, buying a year’s worth of kibble and canned food for my Chihuahua and Pomeranian plus 150 pounds of wild birdseed. But you can only buy so much pet food for yourself — and you don’t want to go broke chasing miles! Here’s the secret: Crowd-source additional orders to earn more points. During the PetSmart promotion, I called all my pet-crazy friends and offered to do their Petsmart shopping for them — and in the process, I earned a ton more miles. Just before PetSmart’s promotion, an online ink vendor was offering 20 miles per $1 spent. If I’d been alert, I’d have asked all my friends and family if they needed ink cartridges — and I’d have even offered them a slight discount to make it a big win-win for all of us. It’s not hard to spend $100 on ink cartridges, and every $100 would have earned me 2000 miles. I’m sad I missed out on that one, but I know another great offer will pop up soon. Find these promotions for yourself on Delta’s Skymiles Shopping, USAir’s Dividend Miles Storefront, United Airlines’ Mileage Plus Shopping, Southwest’s Rapid Rewards Shopping, JetBlue’s ShopTrue, and Virgin Atlantic’s Elevate Fly Store. This hotel booking site offers a ton of miles when you book a hotel through them and complete the stay. RocketMiles offers fewer hotels to choose from than you’d find on some other big hotel-booking sites, but I consider this a plus as I have often hit my head on the keyboard after passing out in my sixth hour of over-researching hotels! However, the prices are the same as you’d pay on other booking sites, and you can earn up to 5,000 airline miles per night. When you want to book, simply enter the city you’re visiting, your check-in and check-out dates, and your favorite airline rewards program. You’ll see a list of hotels with the miles you could earn displayed along with the room prices, making it easy to decide which room to book for the most rewards. You get 5,000 miles when you sign up, book and complete your first stay. If you share your referral link with your friends, you’ll get 1,000 miles each time one of them signs up and completes a stay. Recently, I discovered I had 3,000 old Starwood points from a stay at a Sheraton a few years ago. Actually, not just old — expired. I called Starwood to see if they would restore them, and they did! Immediately, I went to Starwood’s website and converted the points to USAir miles. The conversion rate will vary with the miles program, but Starwood almost always gives a 1:1 exchange, so I got 3,000 miles. Many other hotel points can also be converted to miles. You won’t always get a great exchange rate, but if you’re not using the points to stay in hotels, why not put them to work helping you fly for free? Piling up miles, like so much of life, is about timing. You’ll see low-miles-earning opportunities all the time, like filling out surveys. But to make the big scores, stay alert and be ready to pounce when businesses run promotions. 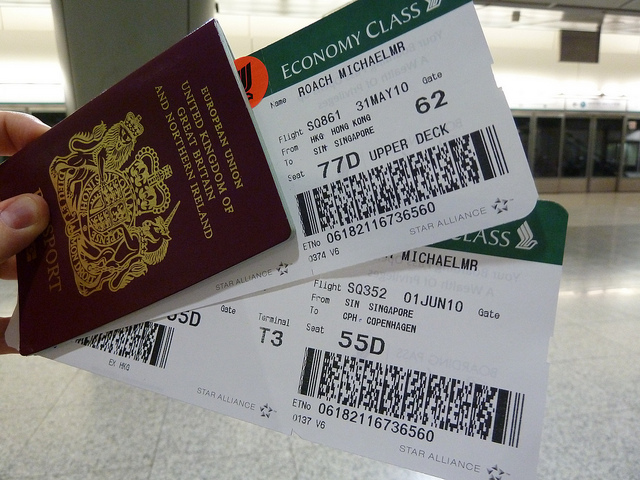 Your Turn: Have you earned a lot of airline miles or points? What are your best strategies? Gail Anthony Greenberg is a recovering marketing exec and current house-flipper who dreams of a world where we can all live well without needing piles of money.